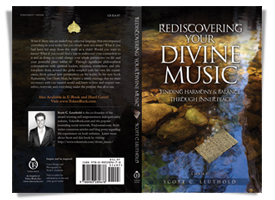 Excerpt: Rediscovering Your Divine Music ©2011 Scott C. Leuthold. All rights reserved. These words speak volumes, yet what do they truly mean? 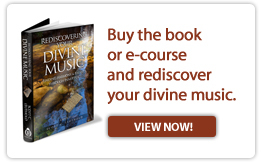 As you will come to realize through reading Rediscovering Your Divine Music, the role that music plays in our lives is infinitely more profound than many truly appreciate. My personal quest has been to come to an understanding of who I am in this reality and what purpose I have for being here. Through this experience of rediscovering my Higher Self and my connection to the harmony of all things, I have spent a great deal of time in deep contemplation, I have philosophized with many friends and colleagues on the subject, and I have often arrived at what I felt might be reasonable perspectives. As time went on, I came to understand that we are here for the journey and not the destination. We are here to learn and grow alongside our friends and family; the fellow eternal spiritual beings that have likely shared with us the journey of many lifetimes. It is my deepest desire that as a result of reading this book you take this simple message into your mind and heart: We are all one. Through my journey of self-discovery, I have found one thing to be profoundly true: There is a music that plays, regardless of whether or not one hears it playing. It is the music of Nature, the music of substance and void, the melody of infinity and immediacy. It is the tune of accomplishment and failure, organized systems and chaos, fear and love, prosperity and poverty, friend and foe, matter and antimatter. All that we think we understand and have yet to discover are cosmic players in a grand, divine symphony, with some of the instruments resounding harmoniously, others dissonantly. We, like everything else, are a part of that company of instruments and contribute to this divine music. However, as we enter this reality, for some reason, our knowledge of this truth is lost. As our physical bodies grow and mature, we often move further and further away from this truth until one day, many of us are no longer emotionally connected to it at all. Our essence is energy and our music continually plays; yet the melody can become muffled and muted until it may no longer be heard. Our developing societies have become focused upon outward desires and have lost touch with personal worth replacing it with material and financial gain. The onslaught of commercialism, relentless exposure to negative media and artificial video game realities, the dependence upon external sources of healing, and the deterioration of our educational system that has significantly diminished the focus on individual creativity, has dampened the full expression of the innate power, unity, peace, and love that resides within. Our natural power dramatically declines when the harmony between the self and the divine is lost. While growing up most of us have been programmed by many disruptive influences from varied sources, including social institutions, family beliefs, and peer pressure, and this programming can adversely influence an entire lifetime. There was a time when I felt I knew everything. Then one day, I discovered that everything I believed to be true might actually not be so. Maybe what I believe to be true isn't true at all, I pondered. Maybe those around me know more and I should adopt their belief as my own. As I matured, I entered a new realization: I began to consider (and eventually decided) that everything I believed was, in fact, my reality. What I believed to be true was actually true… for me. And what others believed to be true was true… for them. This book is about my journey of self-discovery and the experiences I've had that led to a new way of thinking; a mindset that has changed everything in my life. It is about sharing my rediscovery of the divine music that I am and finding that my harmonious melody brilliantly resonates with all that is and ever will be.